Twenty-one landscape lighting professionals headed to Omaha, Neb., for the 4th annual Lighting Summit. Bright lights typically bring to mind big cities like New York City or Los Angeles, but from Jan. 18-19, Omaha, Neb., was the city of bright lights as it welcomed 21 landscape lighting professionals for the 4th annual Lighting Summit. 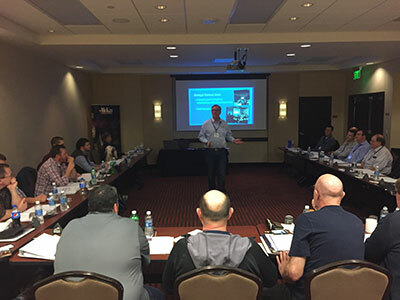 Hosted by McKay Landscape Lighting Owner Jerry McKay, the two-day seminar was held at the Hyatt Place Hotel in downtown Omaha and focused on the importance of digital marketing. Presentations included educational sessions on interacting with the media, building your website into an effective online storefront and a look at McKay Lighting’s in-house marketing strategy. The host company and attendees shared systems and best practices surrounding blog posts and content marketing endeavors. McKay Landscape Lighting also shared its recently launched video marketing effort, much of which was produced in-house on an iPhone. McKay says the videos, which feature employees discussing what they enjoy about working at McKay or customers explaining why they continue to lean on McKay for their lighting needs—are an effort to tell the company’s story. The company is also using video marketing as a tool for customer education with a “Behind the Bid” video. McKay tells its story through video marketing. A session with Chip Thompson, owner of Chip Thompson Design, who designed McKay Lighting’s website, focused on the importance of companies viewing their websites as digital storefronts. The presentation also discussed SEO tips and the anatomy of a successful website. “Eighty-nine percent of consumers do research on the web before making a purchase, and 15 percent vet a company and decide if it’s credible based on what its website looks like,” Thompson said. While these are all great tools, a solid marketing philosophy is also important. McKay Landscape Lighting shared its three-pronged marketing approach, which focuses on reaching strategic partners, existing customers and new customers. It’s important to communicate to each of these segments differently, McKay said. Marketing efforts often get hung up on finding new clients, but McKay stressed the importance of maintaining the ones it already has. The company draws 55 percent of its total sales from existing customers. Event attendees even got a chance to escape the stuffy, florescent-lit conference room. The highlight of the event for many was a home-cooked dinner at McKay’s house followed by a nighttime tour of recent company projects and a look at the company’s immaculate facility, which “only looks this clean once a year,” the owner said. A lot was learned in two quick days, but attendees weren’t alone in gaining insights and taking away tips and tricks to implement in 2017.